Learn About Gentile da Fabriano in Art History, View His Art and Famous Paintings. Gentile da Fabriano, one Italy’s famous artists in art history, is known for one of his most famous paintings, the "Adoration of the Magi", an altarpiece painted for the church Santa Trinita, Florence, 1423. The subject matter, Adoration of the Magi, was an unusual theme for a Florentine altarpiece. Gentlile da Fabriano had the ability to place figures into three-dimensional art space and almost painted an entire receding atmospheric landscape save for the flat, gold, bit of background just beneath the arches of the upper frame that took the place of sky. Fabriano painted very active figures in his artwork. Most figures here traveling to adore the Christ Child. In the upper part of first arch three Magi stand on a mountain looking out a ship awaiting to take them out to sea. In the central panel travelers are winding back up a hill returning to Bethlehem. Directly below Kings wait their turn to worship the Christ Child. All sorts of people are lined up behind the kings. Attendants work to calm rearing horses; others are reacting to something they see in the sky, possibly the guiding star. There are all kinds of different animals, in various places within Fabriano’s artwork, horses, dogs, birds, monkies, oxen, even leopards. Nothing is left out of Fabriano’s art composition. There are farms, ruined architecture, houses vineyards and the cave were Christ was born according to the time. Gentile da Fabriano's figures are well articulated seen especially in the Kings robes. Fabriano painted many different characters displaying a wide variety of emotions. The figures are very active and Fabriano paints them in many different profiles, forward backward and foreshortened. Noteworthy in Gentile da Fabriano’s famous paintings in art history are the predella paintings of this altarpiece. Uncommon for paintings in this period are the night scenes, maybe the first of its kind. The illuminating light from the Christ Child reflects on all nearby objects, on the face of the virgin, on the animals, on the cave and casts shadows on the nearby building. Fabriano is one of the first artists to depict cast shadows from and inner light source, a characteristic commonplace in later Baroque art Painting. 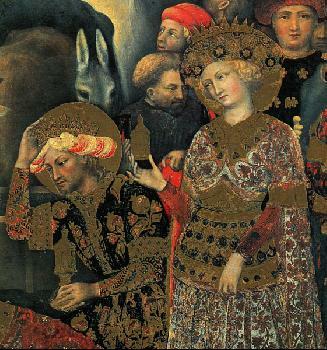 Other famous artists of the Gothic Art period are Simone Martini and Giotto. To view the entire gallery of Gentile da Fabriano, click here.